Depending on the origin of our food, clothes, cosmetics or household goods, our seemingly innocent actions can contribute to human and environmental disasters somewhere on the globe. The Rana Plaza disaster in Bangladesh highlighted the direct links between our consumer choices here in the UK and lives overseas. Ethical choices and consumerism is the topic of our next Peace Café, on Tuesday 17 March at 6pm at LBFN’s home at Collaboration House, 77 Charlotte Street, W1T 4PW (Goodge Street tube). 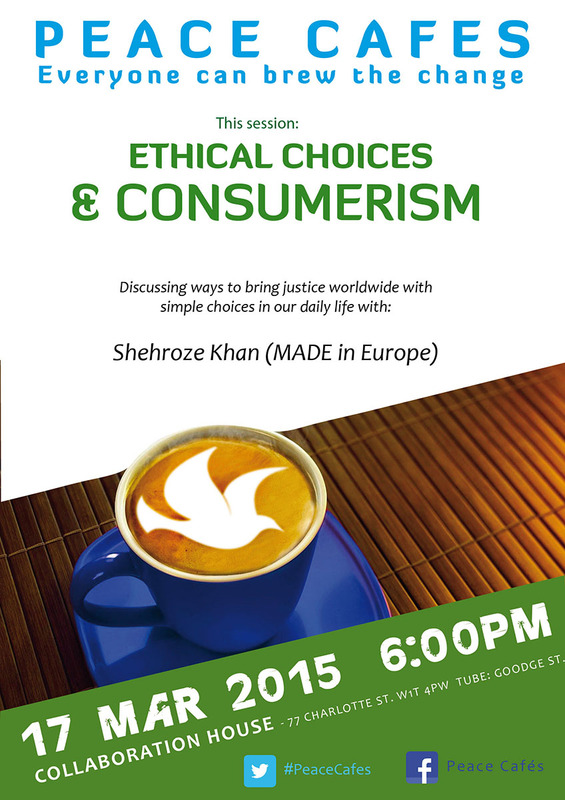 Our special guest is Shehroze Khan from MADE in Europe, a grassroots faith-based charity raising awareness about environmental protection, justice and poverty, and our conversation will include diverse views and a wide range of experiences. Let us know if you plan to come along. Bring a little food (veggie) to share. Everyone can brew the change. We look forward to seeing you there! Let LBFN know if you plan to join us. Bring a little food to share. Everyone can brew the change. We look forward to seeing you there!